Inca is a new emergency stop switch from Jokab Safety for installation inside apparatus enclosures and on panels. 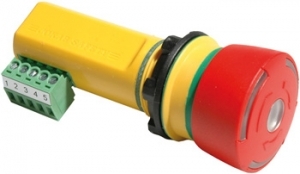 The function and appearance of the button itself are the same as for the company's Smile emergency stop switch, but its unusual format makes it easy to connect via its detachable terminal block. There is an LED inside both the Inca and Smile emergency buttons that shows the current status. A green light means that the emergency stop button has not been pressed, while a red light shows that it has been pressed. If the LED is flashing red and green, an emergency stop button earlier in the loop has been pressed. This diagnostic information permits faster identification of the emergency stop that has been activated. Inca switches are available in two different versions, one for dynamic and the other for static loops. Inca 1 Tina is connected to a dynamic safety loop with a Pluto safety PLC or with a Vital safety module. Inca 1 has connectors for connection to a static safety loop with a safety relay. Both versions of Inca are sealed to IP67 but, with the Inca 1 Tina, the safety circuit meets the needs of EN 954-1 category 4, even if there are several emergency stops connected in series. Inca switches are installed in 22.5mm diameter holes, with an installation depth of just 53mm. The detachable terminal block used to connect the Inca has easily accessible measuring points. Inca is also available with a black button instead of red, for use as a general stop button.